Japan's world-class transportation infrastructure couldn't withstand this month's 9.0-magnitutde quake, but their construction teams are still amazing. This stretch of highway was repaired in just six days by a Herculean road crew. This is the triumph of Japanese engineering. The March 11th quake and tsunami crushed roads, destroyed bridges, twisted trains tracks, and otherwise did to Japan what your little brother did to your ideal Sim City creation when you weren't looking. 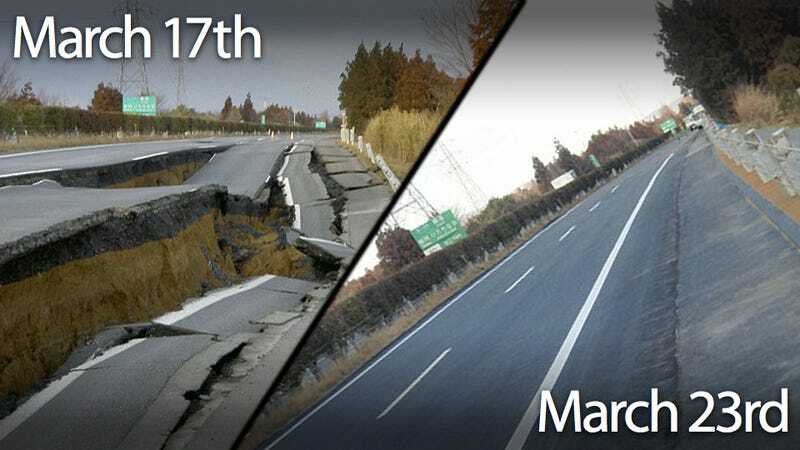 A stretch of the Great Kanto Highway in Naka, Japan looked like the huge crater above on March 11th. The shaking left a 150-meter crack along the main section of the road. Given the massive and widespread damage the workers, many of whom returned to work the next day, likely didn't have long to appreciate their work before moving on to the next piece of cratered earth. Crews from highway repair company NEXCO arrived to start repairing the damaged highway on March 17th. By the end of the day on March 23rd the road was opened to traffic. Just remember this the next time you hit Lake Shore Drive and notice the same pothole that's been there for eight months.